April 7 through 13 is National Library Week in the US, and we’re honoring the occasion by bringing you ghost stories from haunted libraries all around the world! Much like the iconic library scene in the movie Ghostbusters, these literary atheneums are stacked with creepy ghosts, shadow figures, and paranormal activity. Not only do we love tales of the paranormal, we also think circulation of some library appreciation is long overdue, so please check out these 7 haunted libraries around the world before we reference another bad library pun! The library at Combermere Abbey, near Cheshire, England, is said to be haunted. 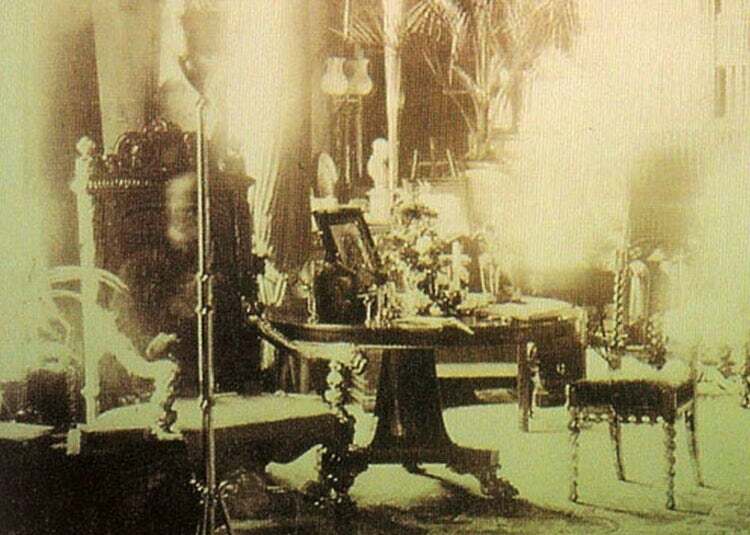 The ghost is rumored to be Lord Combermere himself, who died in 1891 after being run over by a horse-drawn carriage. After members of the Abbey staff reported possible ghost sightings and other paranormal activity, a photographer set up a camera in the library. The camera's shutter was left open for one hour. The staff could claim no involvement with the photo-taking, as they were all at Lord Combermere's funeral, which took place four miles from his home. And yet, when the plate was developed, a ghostly image appeared, seated in the Lord's favorite chair. Long before the Peoria Public Library was ever built in Peoria, IL, a house stood on its site. In the 1830s, a Mrs. Gray owned the home, but fell upon hard times and could not pay her mortgage. The bank foreclosed, and she was forced to leave. But before she did, Mrs. Gray is said to have put a curse on the propertyand anyone who would ever own it. Whether it was her curse or just coincidental bad luck, each subsequent owner experienced a sinking of their fortunes. The Africana Library in Kimberly, South Africa is said to be haunted by the spirit of a man who once worked there. The library was built in 1882, but it wasn't until the early 1900s that the city was able to hire a credentialed librarian. His name was Bertrand Dyer, and while he was qualified for the prestigious position, he soon began to engage in a type of fraud. He would place orders for books, but inflate the price list presented to the city for payment. Dyer pocketed the extra cash. But his scam was discovered, and Dyer was so ashamed that he decided to commit suicide. He took cyanide, but it did not have the immediate desired effect. He suffered in great pain for three days before succumbing in the library where he worked. In the community of Phoenixville, the Phoenixville Public Library is a facility with a rich and notoriously haunted history. The library first came into existence in 1896 as a small collection of books donated to the Phoenixville School District. In 1901, philanthropist Andrew Carnegie donated funds to purchase a plot and construct the public library building. A children’s section of the library was added to the basement in the 1920s, and the following decades saw continual increases in the library’s collection and facility. Although there is little information available about why or how the Phoenixville Public Library became haunted, it has been so for as long as anyone can remember. Several apparitions have been reported over the years, both by employees and library patrons. The original librarian, an old woman in ghostly form, is reported to reside in the library’s attic. A little girl is believed to haunt the children’s library in the basement, and sometimes the elevator leading down to it. And the specter of an old man and his dog have been sighted, inexplicably strolling through the library shelves. One employee, who worked at Phoenixville Library for 17 years, witnessed several examples of paranormal activity during his tenure, including how, after he had carefully pushed in the library’s chairs at closing time, they were found scattered all around the Carnegie Room the following morning. Rocking chairs have also been spotted rocking with no one in them, cold spots have been felt, doors were heard shutting on their own, and fleeting figures have been glimpsed. Phoenixville Public Library has been the site of several paranormal investigations, and teams have reported lots of unexplained equipment malfunctions during filming; one team member who was attempting to film a “mockumentary” project on site even alleged that he dropped something in the attic, which disappeared and was never seen again! When the Chester County Paranormal Research Society spent the night in the library, a night surveillance camera reportedly to caught a book flying off a shelf. Having personally visited this library many times, I never experienced any paranormal activity while inside, but I can say that there is something eerie behind the calm, quiet atmosphere - much the proverbial feeling of “being watched,” even if no one was nearby. Maybe it’s only because I’m aware of the library’s haunted history that I conjured up these spooky feelings, but I still always expected to turn and see something otherworldly around every bookshelf, from the adult room to the children’s basement to the stairwell. The legend of Phoenixville Library’s ghosts is a strong one! What exactly is going on at Willard Library? Judging by pictures snapped on multiple “ghost cams” throughout the building, Willard Library looks to be some kind of paranormal portal into the spiritual dimension. The library’s history is rather benign, having begun its legacy as a private donation library from Willard Carpenter and incorporated to the city of Evansville in 1881. The building, resembling a Victorian Gothic structure, was first begun in 1876, but a depressed economy halted its progress, leaving the foundation unfinished until 1882. It is home to a vast range of genealogy and local history special collections, and also to the ghost of the famous Grey Lady. Psychics visiting the library in 2007 say they were able to verify that a ghost has been there, and paranormal investigative groups have brought in equipment designed to locate it. Several library employees have reported seeing the ghost, including Margaret Maier, Children’s Librarian, and Helen Kamm, Library Assistant. During a visit to the library, lecturers from the University of Southern Indiana say they saw the ghost peering into water. Policemen responding to a security alarm at the library spotted two ghosts in an upstairs window of the library. A library patron reported an encounter with the Grey Lady in the library elevator, and a local weathercaster also reported an encounter with the spirit. Though it has been almost a decade since the Grey Lady apparition has actually been seen, when an assistant children’s librarian saw her in a basement hallway in 2010, paranormal happenings continue to occur throughout the building – and they don’t all appear to be the work of the Grey Lady. Since 1999, Willard Library has been running ghost cams throughout the building, continually filming different areas and streaming online for at-home ghost hunters to search for onscreen ghosts. While some captures could be explained away as misidentified objects, sunlight or shadows, or even real people walking through the rooms, other images are creepy and puzzling. From misty figures to shadow specters to something that looks oddly like a wolf head on a suit of armor, the paranormal happenings at Willard Library are famous, mysterious, and plentiful! A shadow figure appears to descend the stairs. Check out the lower left corner… is it a library patron or a ghostly visitor? An amorphous light appears in the dark library. What exactly is this child seeing? Some people have speculated this is a black backpack… others believe it to be something more sinister. Again… is this a real library patron, or a ghost child caught on camera? Although we narrowed down our blog to these 7 spooky libraries, there are no shortage of haunted libraries across the globe! Do you have any library ghost stories of your own? Share with us in the comments!